TEMPE, Ariz.--(BUSINESS WIRE)--Harvest, a national medical marijuana operator based in Arizona, has merged with Modern Flower, a local marijuana cultivator and leading wholesale cannabis supplier. The merger allows Harvest to become the largest medical marijuana operator in Arizona, with more dispensary licenses and cultivation facilities than any other medical marijuana operator in the state. A national model in the medical cannabis industry, Harvest is committed to helping qualified medical marijuana patients who suffer from cancer, Alzheimer’s disease, epilepsy, multiple sclerosis, AIDS, chronic pain and post-traumatic stress disorder. Harvest holds itself to the most stringent health, safety and quality standards in the industry when it comes to the growth, production and sale of cannabis medicines. Harvest’s offerings include cannabis flower and cannabis oil, along with Dream Steam vaporizer pens which promote the safe inhalation of medical cannabis. The merger will bring six additional Arizona dispensary licenses to Harvest, as well as an 18,000-square-foot cultivation facility in Cottonwood, Ariz. Harvest currently operates dispensaries in Tempe and Scottsdale, along with a 12,000-square-foot indoor cultivation facility in Bellemont, Ariz., and a 35,000-square-foot facility and 3.3 acres of outdoor cultivation space in Camp Verde, Ariz. The latter site features a fully-automated greenhouse with a building management system that senses and stabilizes the environment, thereby increasing efficiency and efficacy. As a result of this merger, Harvest’s total Arizona-based workforce is expected to grow to more than 200 employees by the end of 2017. In addition to rebranding Modern Flower’s cultivation facility in Cottonwood and dispensary facility in Lake Havasu under the Harvest banner, the company plans to open several new dispensaries, including another dispensary in Tempe, at Baseline Road and the I-10, which is anticipated to open in August. Additional Arizona dispensaries are also planned for Phoenix, Tucson, Tolleson, and Cottonwood. Headquartered in Tempe, Ariz., Harvest is a national medical cannabis company that was founded by a business-litigation attorney in 2011. The company currently has dispensary, cultivation, and production licenses in Arizona, Illinois, Maryland, Nevada and Pennsylvania, and plans to expand its reach into more states across the country. 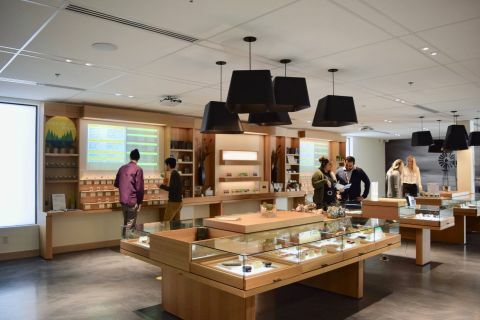 Harvest’s dispensaries closely resemble a sophisticated medical facility or upscale retail store. The dispensaries provide a safe, clean, comfortable, respectful and compassionate environment for qualified patients looking to obtain medical marijuana. While patients who visit Harvest’s dispensaries represent a broad cross-section of the U.S. population, most of them have one thing in common: a serious illness. Terminal cancer, AIDS, epilepsy, multiple sclerosis, and debilitating or chronic pain are among the top conditions that many qualified medical marijuana patients have. To ensure sound manufacturing practices and patient-focused standards, Harvest invited Americans for Safe Access to inspect its facilities, audit its policies and procedures, and augment its training programs. Harvest is proud to be one of only a handful of facilities in the United States to earn ASA’s Patient Focused Certification for retail, cultivation and manufacturing of medical cannabis. Since its inception, Harvest has donated more than $300,000 to Veterans, Seniors, patients-in-need, and charitable organizations that include the American Cancer Society, Bosom Buddies, Ryan House, Climb to Conquer Cancer, and the Epilepsy Foundation of Arizona. The company also operates a 501(c)(3) organization called Harvesting Hope, which was established in 2014 to provide a better quality of life for young children suffering from pediatric epilepsy. To date, Harvesting Hope has provided services to more than 100 families and their children, including guidance on cannabis use for seizure control, educational seminars and discussions, and introductions to medical specialists. Harvesting Hope has also raised money to send children to Camp Candlelight, a camp for children with epilepsy. For more information, visit harvestinc.com. Harvest merges with Modern Flower to become largest medical marijuana operator in Arizona.